How many times have you found yourself watching an advertisement or infomercial on TV with the thoughts that the product could never work? Or maybe you're the one that would love to try the product but don't want to spend the money on a maybe. Either way, you know what I'm talking about. Many of those TV advertisements and infomercials are connected to the well-known As Seen on TV! I had seen Luma Tweeze advertised on As Seen on TV numerous times. Always wondering how well they worked and if they were worth the money. I now can honestly answer that question and am quite impressed with the outcome. Luma Tweeze made it easy for me to shape and tweeze my eyebrows. I've never had it that easy! That little light makes the world of difference. They are also perfect for getting those pesky little splinters out of fingers and toes. The magnifying glass makes it easy to grab hold of and pull it out. 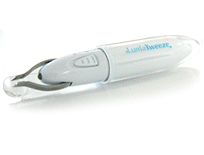 The Luma Tweeze is a must product for any women. With a built-in light and flip-up magnifying glass that will help you get perfect eyebrows every time. *Built in Light and Magnifier - See what you are missing! *Great for tweezing, splinters, or even crafts. *Made of high quality stainless steel, angled blade tips that are perfectly aligned for precision tweezing. Visit As Seen on TV Top 10 and tell me your favorite Top 10 item. A special thanks to As Seen on TV for this great review and giveaway opportunity! I like the Slap Chop! I think my choice would be the Slap Chop. My favorite in the Top 10 as Seen on TV is Weight Watchers! my favorite would be ProActive, that stuff really does work. The pillow pet animals are a favorite of mine. My favorite Top 10 is: The InStyler. I could really use the Swivel Sweeper G2. Like TV Top 10 on FB. The Pillow Pet is My personal favorite! We have 2 for my kids and it's good quality.